The week leading up to Man v Mountain was finally upon me, so it was basically time to keep my fingers crossed and hope that the training I had done was enough to carry me 20+ miles over Snowdon and the North Wales scenery. I still had to keep ticking over for the week leading up to the race, and who doesn’t love a good taper? 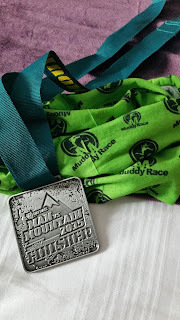 Read on for my time before, during, and after Man v Moutain 2015! Simple enough really, the steady run on the Monday produced a couple of worrying niggles in my left calf and hamstring which only seem to ease off when I’m running – solution = always be running. Thursday was 4 hours in a car which was miserable but on Friday we hit a high ropes course and got a bit a practice in for tackling obstacles and jumping off high objects! On to Man v Mountain itself; I laid out and tried on my kit the night before just to be super safe everything was there and was comfortable, and woke up about 700 times throughout the night dreaming that we had overslept. 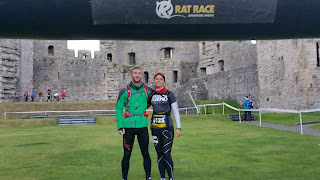 The race began at Caernarfon Castle, a great location to start an epic race, and after much discussion with friends and competitors about how we are all looking forward to the race but unsure how prepared we really were, followed by a good luck kiss from my fiance Chloe and eventual race-winner David Hellard we were off. 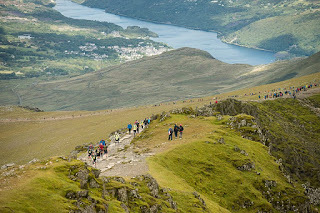 The first section took the form of a 6 mile (give or take) road & path run before we reached Snowdon – I set off at a fairly steady pace and found myself comfortably around 5th place. As this continued though we began climbing higher – being given some long, steady uphill roads to follow. Bearing in mind this was before we reached the bottom of Snowdon it took quite a lot out of me, so when we reached the off-road sections after completing what would be a pretty tough 10k race in itself I had already been reduced to a brief walk once or twice and had been overtaken by plenty of other runners. 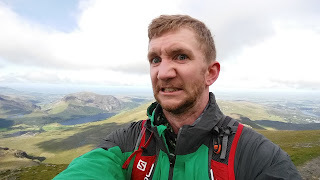 The above picture is an accurate depiction of exactly how I was feeling just before hitting the peak of Snowdon. The trails were long and steady, long and steady, long and steady, before reducing everybody to a walk/scramble up and around the rocky terrain. There were sections that made me feel guilty for walking, yet any attempt at running was quickly dismissed by my tiring legs, there were other sections which were steep enough to be using all of my limbs (all of them) to heave myself up and over. After what felt like forever it was a relief to hit the (busy) peak and know that it would all be downhill from here (sort of). Once again it was on to long, long, steady trails which were covered in loose slate and rocks, meaning that gaining too much speed could be fatal. In fact, my attitude in races was probably best summed up by a photographer who shouted at me “Don’t look at me! You should be looking where you’re putting your feet!”. Fair enough. The descent here felt like it just went on forever and certainly took it’s toll on my right knee, although both legs were feeling generally miserable by this point. At so many points during the descent I thought to myself “I’m ready for this to be over” but it just kept going. before long, however, we were able to drop our bags off and tackle the vertical kilometre – and it was pretty much as awful as it sounds. I ran for about 20 metres of it (although that might even be an exaggeration) and was pretty much resigned to walking to the top. Again this just kept going, but was made up for by incredible sights and scenery around us (although I spent so much time looking at my bloody feet trying not to trip over I didn’t get to appreciate too much of it!). With the vertical kilometre (thankfully) over and done with, we were soon greeted by an abseil down from a railway bridge which was a great novelty to have during a race and perfectly safe despite how many people would be coming through it all day! 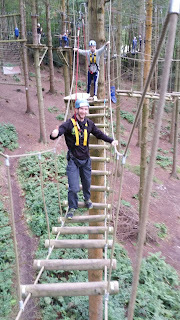 Followed closely by a ‘walk-the-plank’ style obstacle – basically a jump from a ledge into a lake where the cold water refreshed the legs nicely! A few more swims and a slide brought us to the home straight where a couple of easily tackled high walls led us to the finish line! The relief at the end was incredible, as was the feeling in my legs – I think I described the feeling in my hamstrings on the day as “shattered glass” but as tends to happen with a race like this, the best cure for sore legs is a medal around your neck and a disgraceful amount of food! 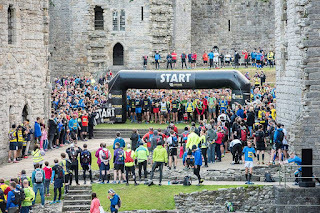 All in all a great race, it very very long and I struggled with the distance more than I expected to – probably should have had a gel before dropping off my bag – but a great experience and epic course! This was the longest it has ever taken me to complete a race and the preliminary results have me in at 25th which is fine by me! So that’s it! Man v Mountain done! Time to get serious about the World Championships now! Did you know yet that I’m being sponsored by the Cheltenham Park Hotel, part of The Hotel Collection, to attend the OCR World Championships? No? Well you do now! Read the first part of The Road to the OCRWC now if you haven’t already!